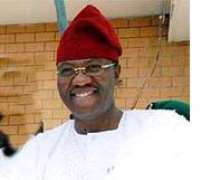 Gbenga Daniles Honourable Wale Alausa, representing Ijebu-Ode Constituency in the Ogun State House of Assembly, has said that governor Gbenga Daniel forced him to take an oath in 2007, contrary to the report in the Nigerian Compass this morning. Reacting to the story, “Ogun 15 lawmakers on blood oath,” Hon. Alausa said it was a fabrication aimed at ridiculing his person and his colleagues in the house by Daniel and his agents. He confessed that the photographs published by Compass today, were genuine but were taken in 2007, inside Daniel's Sagamu mansion and its environs, when he was forced to take an oath before he could get the PDP ticket to the state House of Assembly. The lawmaker said he and his colleagues (G15) never took any oath and neither did they visit any shrine in Ijebu-Igbo to take an oath, adding that it was pure blackmail by Daniel to stop the House from carrying out its oversight functions. “The photographs on the front page of Compass today, were truly mine but the story was fabricated. I was forced to take the photographs in governor Daniel's Sagamu home in 2007, when he forcefully implemented the oath on me in order to get me a ticket to the House of Assembly. And that is what he has done to everybody. “Let him come out and deny, if he did not compel my father, Chief Agboola Alausa, to persuade me to take the oath. I rest my case for now. But the struggle continues,” he said. According to Compass: “the crisis in Ogun state involving the G 15 members of the House of Assembly was triggered by a blood oath taken at a shrine in Ijebu-Igbo, Ijebu North Local Government, last year, the Nigerian Compass learnt last night. “The members took the oath to ensure a united front against governor Gbenga Daniel. The oath was sponsored by some politicians including the father of a prominent politician in Abuja, a Senator, a former South-West governor, a former minister and another prominent politician in Ogun state.” The report added that: “the oath, which was taken naked by the members and in daylight, was witnessed by the sponsors and the native doctors, the administrators of the oath. “Items used for the oath included blood, cow heads, calabash and other fetish materials. Each participant swore to upholding opposition to Daniel at all times and submitted to the death of their first born, should they renege on the oath. “Each of them was required to mention the name of their first child in the course of the oath, setting in motion serious consequences for the children should their fathers go back on the prescribed course of opposition.